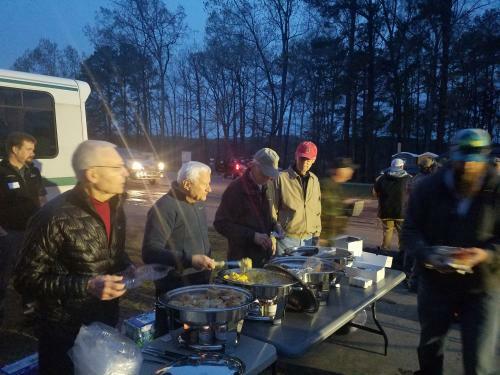 On April 4th, four of Galloway Ridge’s veterans gave of their time and energies (and got up REALLY early!) to serve their fellow veterans. John Stell, Al Schalk, Chet Rogers, and Bob Kelly found their way to the GR kitchen for a 5:30 AM departure to Jordan Lake. These fine veterans/residents spent their morning assembling and serving biscuits for Operation North State. Operation North State is an organization that throws fishing “tournaments” at many of the lakes throughout North Carolina. They bring out disabled veterans and wounded warriors for a day of fishing. The veterans are taken out by volunteer boaters/fisherman that spend all morning and part of the afternoon taking the veterans around the lake and assisting them in fishing. The day culminates with a weigh-in to determine the best fisherman, but the day is really about honoring these veterans who have sacrificed their health and well-being for our country. And to give back to them by giving them a day of activity and “normalcy” to some who struggle. Thank you gentlemen for your service and your service to others who have served! Thanks also to Josh Carr and Jason Carter getting up early and helping make this happen.